The History of the City of Pisa and its Leaning Tower – Pisa, Italy – Italy’s history is richly enlivened by the role that the City of Pisa played. Pisa was a place where many people gravitated as the city was one of Italy’s most vital ports and its busiest trade center. In its earliest days, Pisa served as a stopover for those traveling from Europe to Jerusalem. Pisa also had a military might that ensured their city was a safe harbor for these pilgrims; in fact, this military successfully helped the people of Salerno defend themselves from ruthless attacks in 871 AD, and it was this same strength that successfully forced back the troops from Arabia that attempted to invade both Corsica and Sardinia nearly 200 years later. It was this success and strength of might and courage that brought this small port city to great power. In fact, Pisa took over control of Corsica in 1077 in an effort to keep the island safe from further intrusions. A little over twenty years later, they did the same for Spain’s Balearic Islands. The City of Pisa enjoyed a great prosperous time. The City of Pisa began to decline, however, once the Genoans were victorious in a battle in 1284. The islands that Pisa controlled were then lost, and their mighty influence was in decline. The end of Pisa’s prosperity came in the 1400s, when the Arno River filled with so much silt that it created a barrier between Pisa and the ocean. The great City of Pisa no longer had the ability to be a prosperous port and therefore, this was the final blow that ended the Pisan’s power, wealth, and might. Near the end of the 12th century, Pisano began to lay a foundation of marble that was so large, there was room enough to place 16 vehicles on it. Thus began the construction of a cathedral for Pisa. It took nearly 200 years to complete the tower. It took nearly 15000 tons of marble and cost the city a grand amount of money. At completion, it was quite a marvel to behold, except for one strikingly embarrassing flaw – it was noticeably crooked. Ground water levels in the area were exceedingly high, so Pisano was only able to dig a foundation to a depth of roughly ten feet. As each story was completed, the southern side of the tower sunk lower and lower. 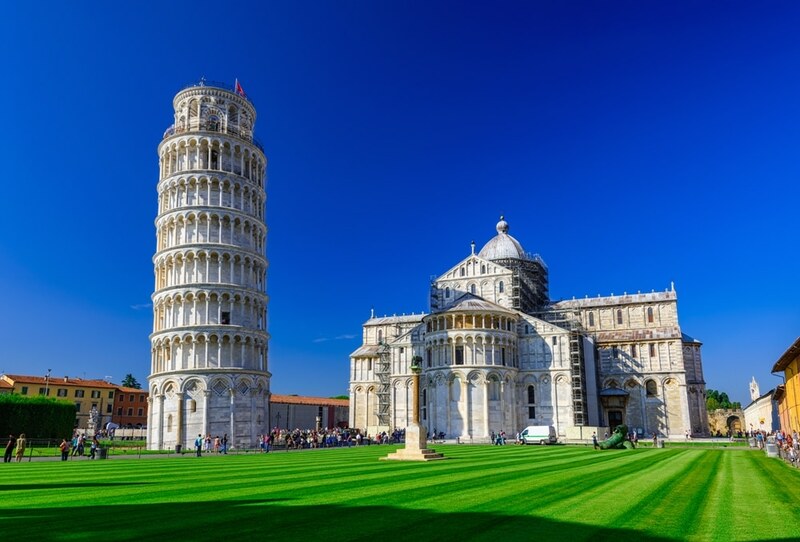 The builders attempted to correct matters by adding an inch to all measurements along the south side of the tower, but no matter what they tried, the Tower of Pisa owns the familiar term by which it is known today – the Leaning Tower of Pisa.